A 1937 Talbot-Lago T150-C SS Coupé is the first highlight announced for the RM Sotheby’s Villa Erba classic car sale on Lake Como in Italy in May 2017. A sensationally beautiful 1937 Talbot-Lago T150-C SS ‘Goutte d’Eau’ Coupé by Figoni et Falaschi leads early entries for the RM’s Concorso d’Eleganza Villa d’Este sale to be held at Villa Erba on the shores of Lake Como in Italy in May 2017. 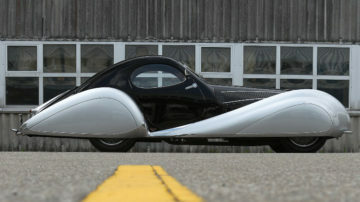 This spectacular art deco masterpiece is one of only 16 “teardrops” ever built and is expected to achieve €3.200.000–€4.200.000. In 2017, the classic car auction will be held on May 27. As in previous years, only around 40 cars will be offered. In 2015, RM Sotheby’s had 37 cars on offer that with a sell-through rate of 90% achieved €26.7 million. 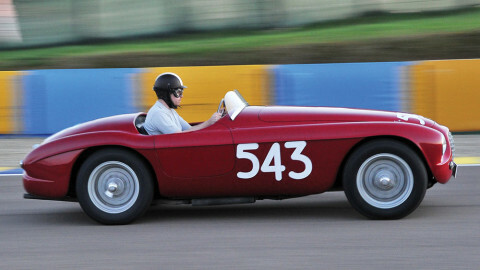 The top result set a new model record when a 1952 Ferrari 212 Export Barchetta sold for €6,720,000 ($7,400,736). 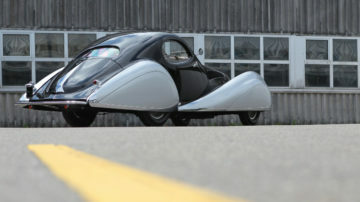 RM Sotheby’s announced an exuberant 1937 Talbot-Lago T150C SS ‘Goutte d’Eau’ Coupé by by Figoni et Falaschi (Est. €3.200.000–€4.200.000) as the first highlight for the Villa Erba 2017 sale. The Talbot-Lago T150C SS ‘Goutte d’Eau’ Coupé is considered by many as one of the most attractive automotive designs of all time. This design by Figoni et Falaschi is nothing short of an art deco masterpiece on wheels; its fanciful curves and sensuous lines largely credited as ushering in the era of the automobile as an art form. Also known as the ‘Teardrop’, the ‘Goutte d’Eau Coupé’ represents the finest collaboration between the famed Parisian coachbuilders, Figoni et Falaschi, and the celebrated French marque. In total, just 16 cars were ultimately produced in two series. As each was coachbuilt, there were minor, and sometimes, even major variations from one car to another. 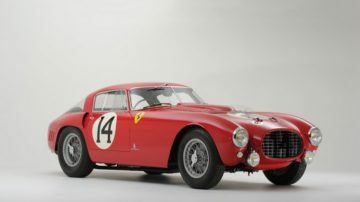 According to Claude Figoni, the example secured by RM, chassis no. 90110, is the second car built with front spats, and has remained in Switzerland the vast majority of its life. The recipient of a magnificent, concours-quality restoration in 2002, it is sure to impress at RM’s Lake Como, Italy sale, scheduled 27 May during the Concorso d’Eleganza Villa d’Este weekend (Est. €3.200.000–€4.200.000). “The Talbot-Lago T150-C SS ‘Goutte d’Eau’ Coupé remains one of the most spectacular automotive designs the world has ever seen. To that end, chassis no. 90110 is a terrific fit with the Concorso d’Eleganza Villa d’Este sale, which is dedicated to celebrating excellence and beauty,” comments Augustin Sabatié-Garat, Car Specialist, RM Sotheby’s. 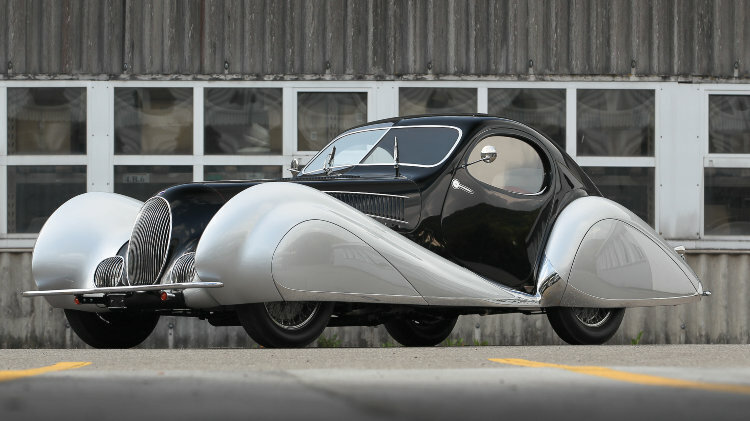 RM Sotheby’s sold a 1938 Talbot-Lago T150C SS ‘Goutte d’Eau’ Cabriolet by Figoni et Falaschi for a marque-record $7,150,000 at the Art of the Automobile Sale in New York in 2013. Although the coupe is estimated to achieve half of that price for once the coupé show off the outrageous lines of this 1930s design even better than the roofless car. 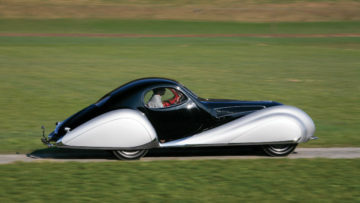 RM Auctions also sold a 1938 Talbot-Lago T150C SS for €3,136,00 ($4,475,00) at the Villa Erba 2011 sale. The only other car thus far announced for the auction is a 1957 BMW 507 Roadster Series I, which will no doubt please the main sponsor of the Concorso d’Eleganza Villa d’Este.